Bus accidents are unfortunately a fairly common occurrence in New York and across the country. These accidents can result in severe injury, impacting your ability to work or live a normal life. Insurance companies will try to compensate you as little as possible, which is why you need a skilled New York bus accident lawyer to work on your behalf to obtain the maximum compensation possible. 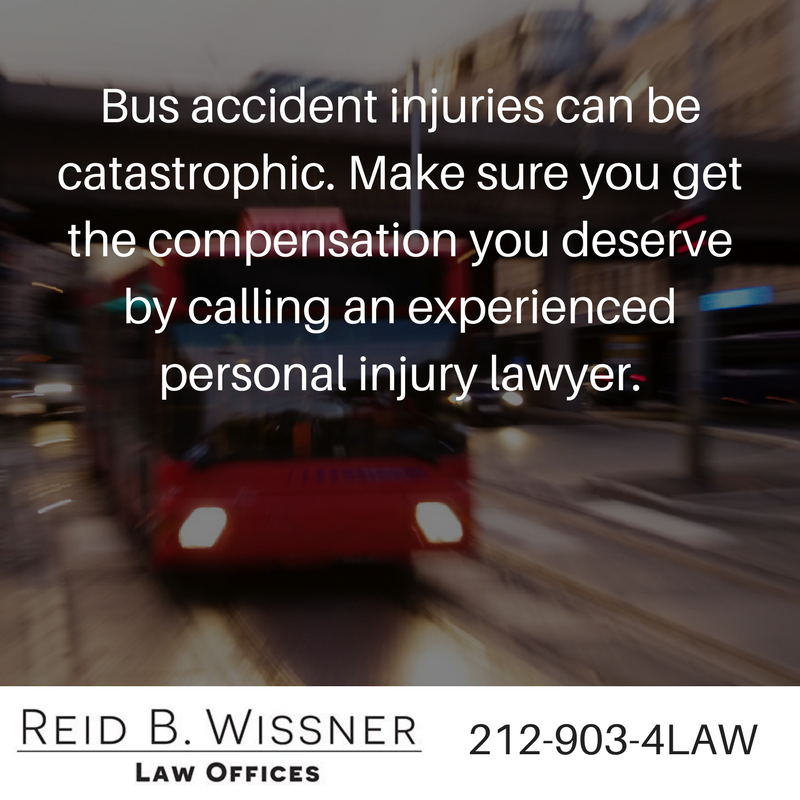 If you or a loved one has been in a bus accident, don't hesitate to contact Reid B. Wissner Law Offices at 212-406-9288 to schedule your free case evaluation. Reid Wissner has years of experience representing bus accident victims, and will help you get the compensation you deserve. Determining fault in a bus accident is key toward helping you obtain a favorable outcome. In many bus accidents, the party at fault is either the bus driver, the bus management company, the manufacturer of the bus equipment, or another negligent or intoxicated driver. Reid B. Wissner is an experienced personal injury lawyer who can help determine fault in your case to ensure a favorable outcome for you. Injuries arising from bus accidents can be catastrophic, resulting in hospital stays, extensive time off work, rehabilitation, physical therapy, and even the need for in-home care. All of these expenses can add up quickly, and often your insurance company's first settlement offer is not nearly enough to cover it all. Even if you do not think you've been seriously injured following a bus accident, it's vital to see a doctor as soon as possible to make sure. Some injuries do not appear to their full extent until days or weeks afterward, and other injuries may be more serious than you think. If you wait for too long before seeing a doctor about bus accident related injuries, it may damage your case. Bus accidents can be traumatic, and you may just want to take your insurance company's first settlement offer and be done with it. However, this does not benefit you or your family in the long run. Medical bills often end up exceeding what insurance companies are willing to offer, leaving you in a bad place. Medical debt is the leading cause of personal bankruptcy in America, and often arises from medical emergencies a person has no control over, such as a truck, bus, or car accident. If you have been injured in a bus accident, an experienced attorney is necessary to have on your side so that you are able to get maximum compensation. We offer free case evaluations for all bus accident victims, so don't hesitate to call Reid B. Wissner Law Offices at 212-406-9288 to schedule yours. We don't want concerns over bus accident attorney fees to prevent you from getting the legal help you need, so in addition to free consultations, we also do not charge you anything unless your case is successful. We serve clients in the Bronx, Brooklyn, and Queens areas of New York.